electric drive has a new look. 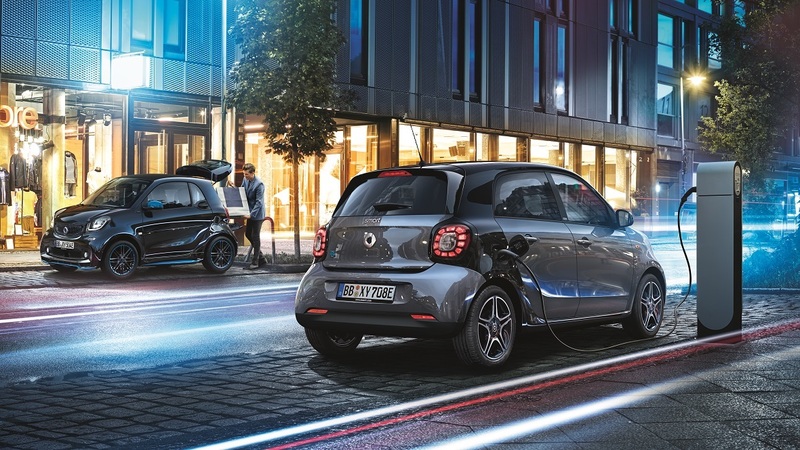 Because the smart EQ fortwo and forfour produce zero driving emissions*, you’re doing your bit for the environment and making cities a cleaner, more pleasant place to be. But you’re also doing yourself a favour by reducing running costs. 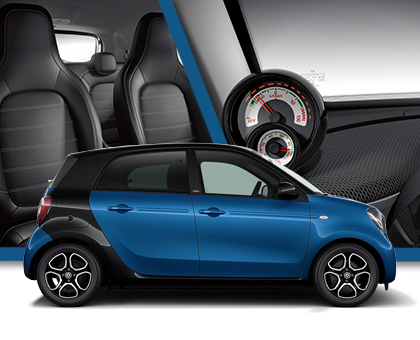 All smart EQ fortwo and forfour models are in Vehicle Excise Duty Band A, so you’ll pay no road tax. You’ll also qualify for the Office of Low Emission Vehicles (OLEV) car grant, offering up to £3,500 off the cost of the car. And you may benefit from other savings such as free or subsidised parking. 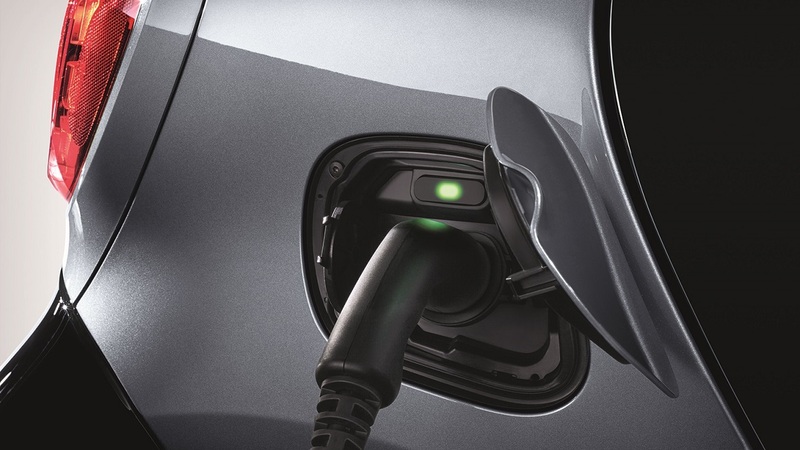 Unlike petrol cars, electric cars deliver power to your wheels as soon as you push on the pedal, with no lag time. 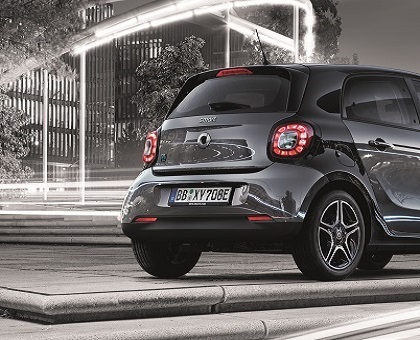 So the smart EQ fortwo and forfour models feel even more agile and responsive than its petrol-powered counterpart. It’s efficient too, using a regenerative braking system to harness kinetic energy, every time you slow down this is energy that helps charge the battery. Just like your smartphone, you’ll soon get into the habit of charging your smart overnight or while you’re at work. Ideal for your garage, carport or company car park, a wallbox is the fastest way to recharge, taking the battery from 20-100% in just 3.5 hours. You can also charge your smart using any domestic power socket from 20-100% in around 6 hours. *price correct at time of publication, subject to change. Price includes £500 OLEV (Office of Low Emission Vehicles) EVHS (Electric Vehicle Homecharge Scheme) Grant. **The OLEV EVHS Grant is subject to terms and conditions, and eligibility may be revised or withdrawn at any time without prior notice. Where is the nearest charging station? Find public and semi-public charging facilities for your electric car - worldwide. Hover over the map to find your nearest charging station. 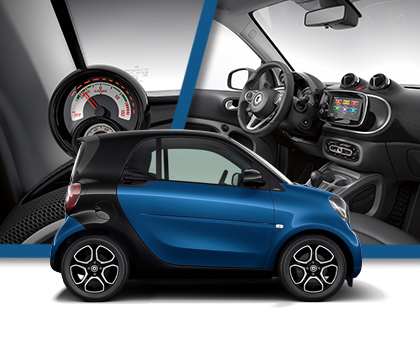 The smart EQ fortwo coupé prime. 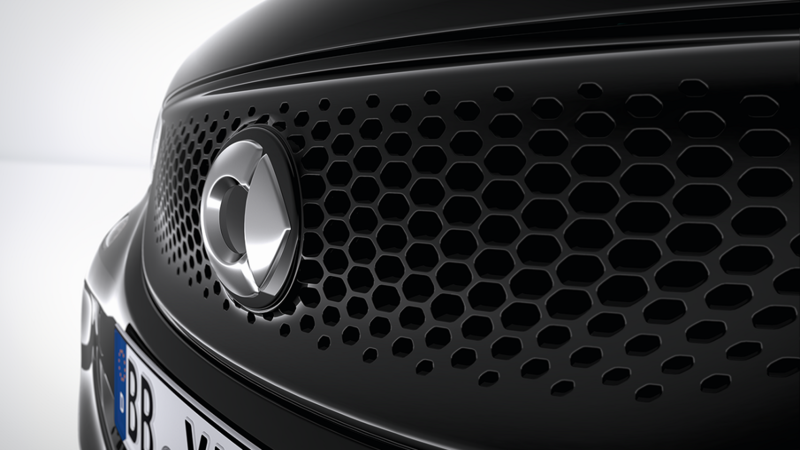 ^Based on a smart EQ fortwo coupé prime 82hp (22kw). 36 month Personal Contract Hire. Advance rental of £1,971. 7,000 miles per annum. Vehicle condition, excess mileage and other charges may be payable. No ownership option. Subject to status. 18s+. Offer ends 31.03.19. Mercedes-Benz Finance. MK15 8BA. Model shown includes optional metallic body panels at £295. 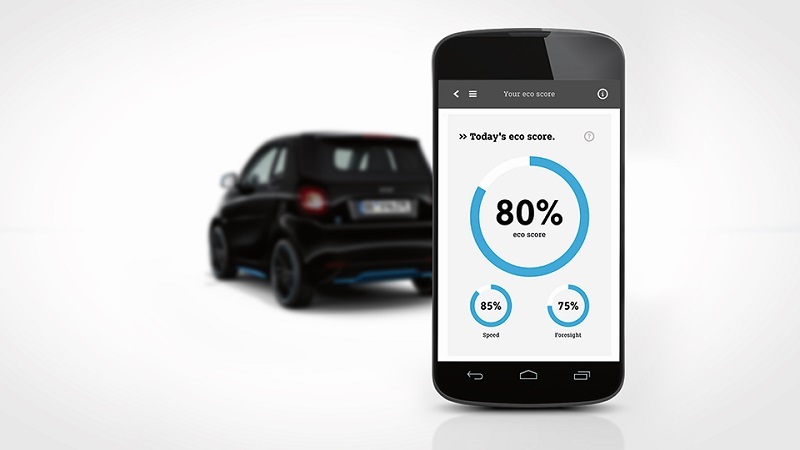 Smart EQ control offers numerous "Connected Car" functions from viewing the remaining power left in your battery, predict driving range, charge status and a whole range of other information relating to your vehicle. You can also set the climate control while your smart is charging from the mains, so that your car is ready to go as soon as you are. 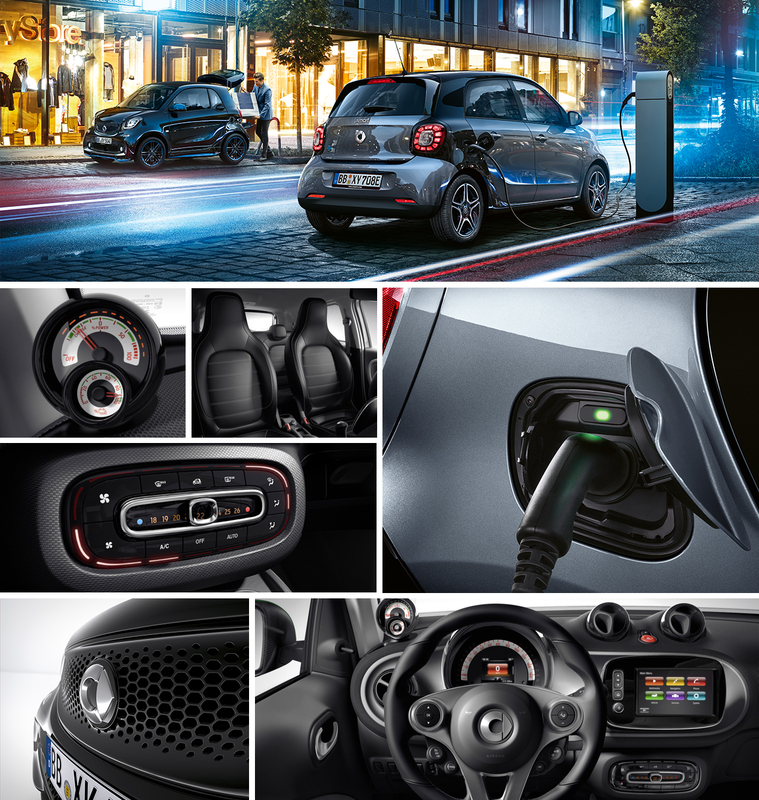 Just like the rest of the smart range, smart EQ fortwo and forfour models are packed with features to maximise safety and practicality. Made of high-tech steels, the tridion safety cell keeps you and your passengers well protected. The smart Media-System with 7-inch display offers 3D navigation, hands-free calling, and music streaming. 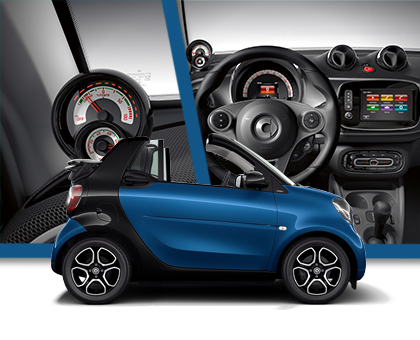 On all smart models the front seat backrest folds down fully so you can load longer items. The OLEV grant is subject to terms and conditions and eligibility may be revised or withdrawn at any time without prior notice. From 20—100% charge in approx. 3.5 hours when charging at a wallbox. Depending on the local electricity infrastructure and the charging current set on the charging cable. * CO2 figures have been converted into NEDC-equivalent values for use with the current VED and BIK tax legislation. Figures shown are for comparability purposes; only compare with other cars tested to the same technical procedures. Figures may not reflect real life driving results, which will depend upon a number of factors including the starting charge of the battery , factory fitted options, accessories fitted (post registration), variations in weather, driving styles and vehicle load. Further information about the test used to establish fuel consumption and CO2 figures can be found at https://www.smart.com/uk/en/index/wltp.html.